Galaxy Plastics LTD. takes special pride in our abilities to provide special fabricated PVC products in a highly time sensitive fashion. 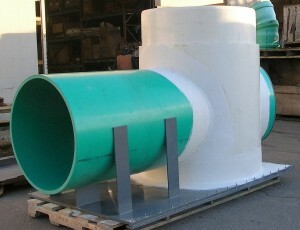 These fabrications vary in size from 4″ all the way to 48″. With Galaxy Plastics’ experienced employee and manufacturing capabilities, we are able to work with you and your challenge in developing a workable solution that suits your needs. 30x30x30x10 C900 custom fabricated cross. 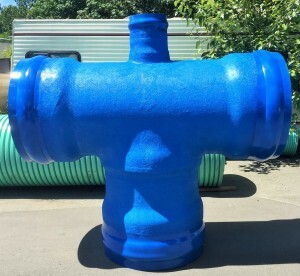 All of Galaxy Plastics tees, wyes & crosses are “pulled” as opposed to a “cut & weld” method, C900 fabricated fittings are then finished with a reinforcing fiberglass wrap. 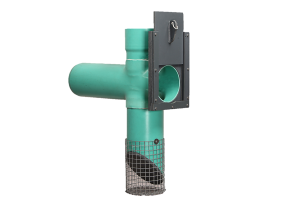 Galaxy Plastics’ Flow Control device are the choice of utilities due to our dependable workmanship and quality. 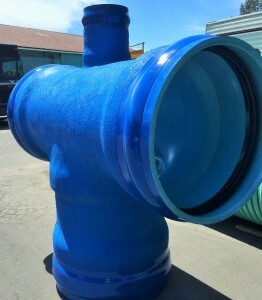 All of our flow controls are fabricated to your submitted dimensions to match your project requirements. Contact Galaxy Plastics sales to get your Flow Control request started!